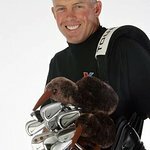 Steve Williams has been Tiger Woods' golf caddy since 1999. He established the Steve Williams Foundation to help young golfers. Google trends for "Steve Williams"
We don't have any videos related to Steve Williams.